Steve has been practicing the heritage art of blacksmithing for over 20 years. He joined the Possum Trot Forge Council and began learning from the “old guys”. This wonderful group of blacksmiths has been very helpful and supportive. 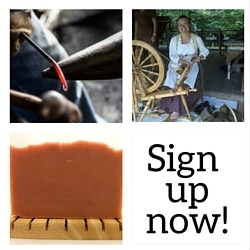 For several years, Steve has been demonstrating at local events and craft shows, at times dressing in his colonial or civil war era clothing. It is quite amazing how many people have never really seen a blacksmith at his/her anvil. Children are mesmerized and older adults are nostalgic. As a teacher, Steve is irresistibly drawn to children and vice versa. The kids can’t wait to “take a whack” on the metal and will crank the blower for hours just to get a chance to participate! In 2005, we opened our farm to tours, with a blacksmithing demonstration being one of the main events. Check our Farm Tour page for more information. 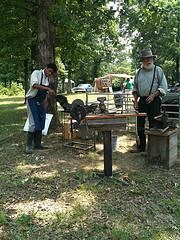 Steve also now offers a variety of blacksmithing classes and workshops here on the farm. In our shop we sell a variety of his hand-forged items. One of the most popular being historic markers. Several small towns in our area are using these reasonably priced markers to point out sites of interest or historic preservation in their area. Others are using them to act as an address marker for their yard make their home look unique.